U.S. intelligence analysts turned to multibillion-dollar super-secret satellites in their quest to find answers to what happened to a Malaysian airliner over war-torn eastern Ukraine last week. The answers, according to unnamed U.S. intelligence officials, point to a missile launch from territory held by rebels near the Ukrainian border with Russia. Satellites hovering over Eastern Europe at the time of the crash Thursday were capable of detecting the fiery plume from the launch of a surface-to-air missile or the fireball produced if the rocket struck a jumbo jet at cruise altitude, according to Marco Langbroek, a Dutch archaeologist and a respected amateur satellite tracker. Langbroek posted the information on his blog Friday. Malaysia Airlines Flight MH17 was traveling from Amsterdam to Kuala Lumpur. All 298 people on the jet died. U.S. spacecraft over the region could have also picked up the radar signature from a missile battery as it scanned the sky and locked on to an airliner. According to a report by CNN, citing an unnamed U.S. intelligence official, analysts received data indicating an anti-aircraft missile system was turned on -- possibly by detecting the battery's radar signals. Separate data show a heat signature that may be from the plane being shot down, CNN reported Friday. U.S. Secretary of State John Kerry told NBC News on Sunday that intelligence officials knew the trajectory of the rocket and could trace its origin to a rebel-held region. A network of military-operated satellites were in view of eastern Ukraine on Thursday, according to Langbroek, who contributes tracking data to community of amateur satellite observers. The U.S. Air Force does not publish the locations of many of its spacecraft, so independent observers collect sightings to build estimates of their orbits. The Air Force releases orbit data on satellites owned by commercial firms, NASA and NOAA, international governments, and some U.S. military craft, such as navigation and communications satellites. The Air Force's Space Based Infrared System was developed to detect strategic missile launches. Originally a product of the Cold War, when the U.S. military wanted early warning of a nuclear attack, the system now features modernized satellites with the sensitivity to see conventional short-range missiles, large explosions and wildfires. The SBIRS constellation includes dedicated satellites flying in geostationary orbit, a ring 22,300 miles above the equator. 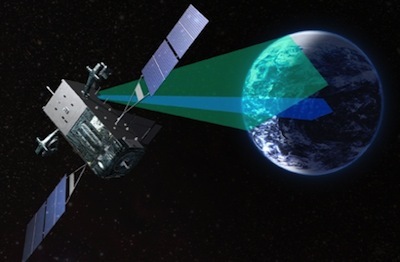 The Air Force also has infrared missile-detection payloads on top secret National Reconnaissance Orbit satellites in oval-shaped "Molniya" orbits to provide polar coverage. The fully operational SBIRS network will have four satellites in geostationary orbit, known as SBIRS GEO, and two hosted payloads on classified NRO satellites, called SBIRS HEO. Two SBIRS GEO satellites were put in orbit by United Launch Alliance Atlas 5 rockets from Cape Canaveral in May 2011 and March 2013. 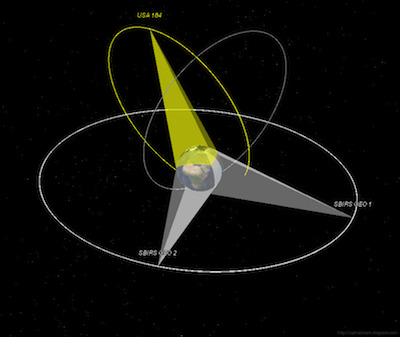 Two SBIRS HEO payloads were launched into high-inclination orbits from Vandenberg Air Force Base in California in 2006 and 2008. According to Langbroek, the SBIRS GEO 1 and SBIRS GEO 2 satellites were in view of eastern Ukraine at the time Flight MH17 went down Thursday. Another SBIRS payload mounted on an NRO satellite dubbed USA 184 was also over the region. If U.S. intelligence agencies detected the surface-to-air missile system's radar via satellite, several signals and electronic eavesdropping spacecraft were above Eastern Europe that may have been up to the job, Langbroek wrote. The geostationary satellites carry two types of infrared sensors. One scans across the planet looking for missile launches, and the other stares at specific region to expedite notification of launches. Air Force officials say they are still wringing out issues with the SBIRS staring sensor, including the proper tuning of the instrument and the installation of upgraded ground infrastructure to receive, analyze and distribute staring sensor data. The SBIRS satellites followed the Air Force's Defense Support Program, which launched 23 missile warning spacecraft between 1970 and 2007. U.S. government officials told reporters they have strong evidence the missile that allegedly downed the jet was fired from an area near the Russian-Ukrainian border controlled by Russian-backed rebels. The Boeing 777 jetliner was flying at an altitude of 33,000 feet when it was hit, officials said. "We have very strong evidence that it was a surface-to-air missile -- the SA-11 -- fired from a location controlled by Russian separatists near the border, most likely on the Ukraine side of the border," said Rear Adm. John Kirby, the Pentagon press secretary. "Beyond that, exactly who -- whether it was a Russian military unit that did it or it was a separatist unit that did it, we don't know. Whether it was a system that was driven across the border by Russians and then handed off to [the rebels], we don't know," Kirby said Friday. The mobile missile system believed to have shot down Flight MH17 is known as the SA-11 Gadfly by the North Atlantic Treaty Organization. Its official Russian designation is the Buk-M1. "The missile itself, the SA-11, which is the one we believe was used to down Flight 17, is a sophisticated piece of technology," Kirby said. According to an assessment by IHS Jane's, an independent military and aerospace group, a typical Buk-M1 battery includes a command post vehicle, a target acquisition radar vehicle and six self-propelled mounts that act as the launcher vehicles. Kirby said some of Russian-backed separatists in Ukraine have received training in vehicle-borne anti-aircraft systems. "Over the last several weeks, Russian-backed separatists have shot down a Ukrainian transport plane and a Ukrainian helicopter, and they claimed responsibility for shooting down a Ukrainian fighter jet," said President Barack Obama. "Moreover, we know that these separatists have received a steady flow of support from Russia. This includes arms and training. It includes heavy weapons, and it includes anti-aircraft weapons."